Yoga on the Farm, Art Opening & So Much More! 2:30pm – 30-minute yoga session for kids, parents or parents & kids together. Will take place in the farm’s Learning Garden just behind the big red Dairy Barn. 5:00-6:00pm – Family friendly late-afternoon relaxation session. Release the day’s tensions amid the flora and fields of our beautiful 57 acres, and enjoy some hot tea afterward. Each session led by Woodbridge resident, Diane King. If farm parking lot is full, please follow signs to park along Ford Street or in the former Hilltop Health Center parking lot, across the street at the corner of Ford Street and Ford Road. For your safety, no parking along Ford Road please. However, if you just can’t wait, you can find us this weekend at both the Wooster Square Farmer’s Market (Saturday 9am-1pm) and Edgewood Park (Sunday 10am-1pm). We’ve just begun harvesting our famous strawberries, so get them while you can! We look forward to sharing another bountiful season with you! Help Massaro pay homage to its roots during this – its Centennial Celebration year – as it joins forces with Palette Art Studio to support local artists who’ve supported the farm. Palette Studio is the brainchild of mother-daughter team, Natasha and Vasilisa Piskunova, whose original Cheshire studio opened in 1997. Both locations offer classical and contemporary painting and drawing for individuals and groups of all ages. A Season of Creativity, will feature farm-themed works of artists who have supported the farm through past donations of their artwork. 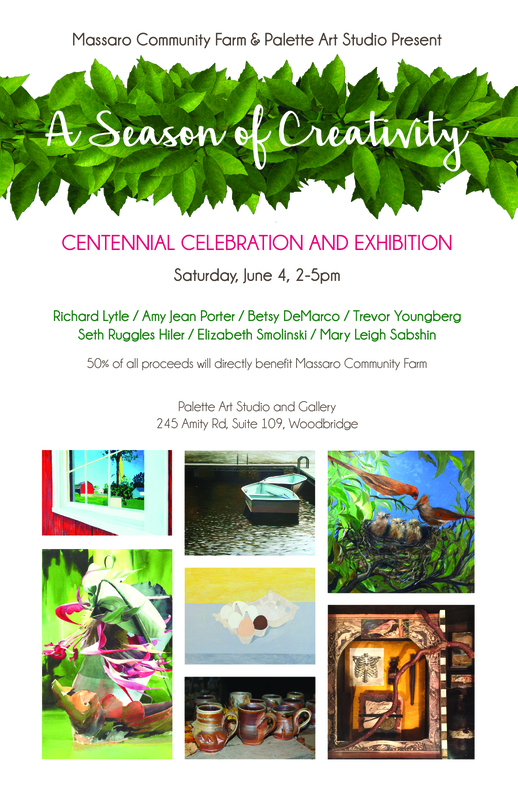 Visit the studio Saturday, June 4, 2-5 PM for the opening of this exhibit to learn more about the farm’s centennial and Palette’s art class offerings. Meet the artists and to celebrate the launch of Massaro Farm’s seventh growing season. 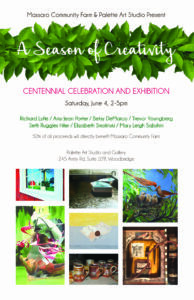 Additional gallery hours on Sunday, June 5, 2-5pm. Works will be on display through June 19. Light refreshments will be served. Featured artists: Betsy DeMarco / Seth Ruggles Hiler / Richard Lytle / Amy Jean Porter / Mary Leigh Sabshin / Elizabeth Smolinski / Trevor Youngberg. As an added plus, the opening will coincide with the Woodbridge Business Expo, Coachman Square, 21 Bradley Road, Saturday, June 4 from 10am-2pm. Support your local business community by discovering all the great businesses nearby! DO YOU DREAM OF A BETTER WORLD? Join Woodbridge residents and Yale professors, Mary Evelyn Tucker and John Grim, as they lead a conversation on how citizens around the globe are envisioning a new, environmentally viable future for our planet, starting right here in Woodbridge. What can you do to realize a lighter impact on the Earth? What are the appropriate human-earth relations that will help future generations flourish? Sustainable agriculture being practiced at Massaro Community Farm is just one piece of the puzzle. If you haven’t seen the documentary, Journey of the Universe, co-produced by Tucker and Grim, you can view it HERE (use password: whowouldyoube619). And join the conversation at the Woodbridge Library, Wednesday, June 8th at 7pm. 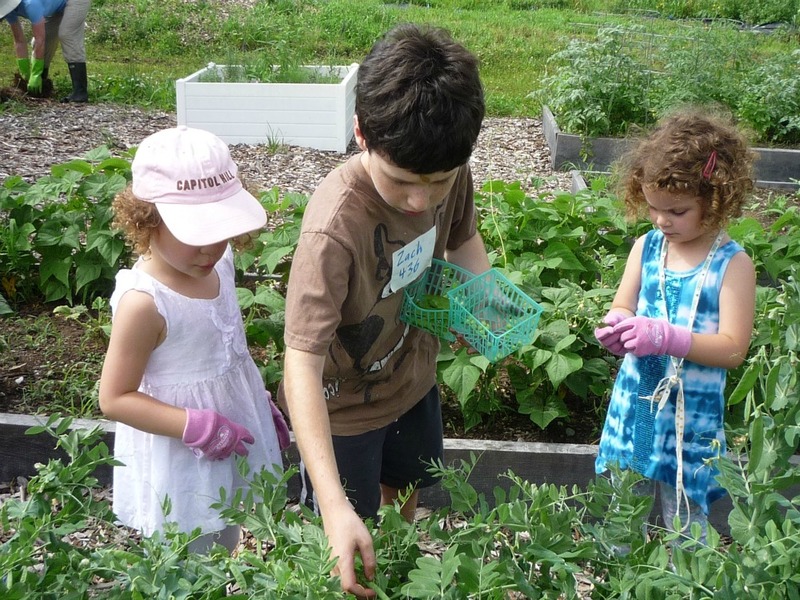 Open Farm Days, our drop-in sessions to plant, water, harvest and so much more in the Learning Garden will begin Friday, June 17th, 2:30-5:30pm. This is your opportunity to introduce your little ones to the joys of picking your own veggies. Use our color-coded tags to learn what’s just been planted and what’s ready for you to pick! Tools and gloves provided. Bring a water bottle if you plan to stay for a while. The Learning Garden has expanded this year with more beds, blueberry bushes, and more dates (including some Saturdays!). Check our website calendar for a full schedule. Register now for summer camp or book a field trip! Registration is now open for Woodbridge Rec Camp at Massaro CommunityFarm. 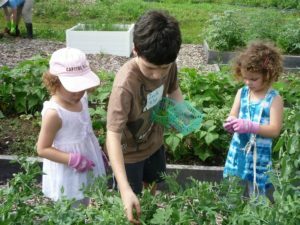 Our summer camp program picks up where Woodbridge Rec leaves off with morning half-day sessions for 6-9-year-olds exploring the farm and nature trail. We’d love to be able to offer this camp for third week as well, August 22-26. If you’re interested in registering your child during this week, please us know by calling the farm office (at 203-736-8618) or making a note on your registration form when you send it in. We’re also booking summer field trips for your camp, home school group or organization. Check for available dates by calling the farm office or checking with Education Director, Robyn Stewart, via email, education@massarofarm.org. WILL YOU TAKE OUR SHORT FIVE-QUESTION SURVEY? As we grow and mature as an organization, we are continuously working to maintain our commitments to maintain a historic farm, feed those in need and connect with our community. Please take a few minutes to complete our short five-question survey. Your feedback is greatly appreciated and will help us improve and shape future farm offerings.